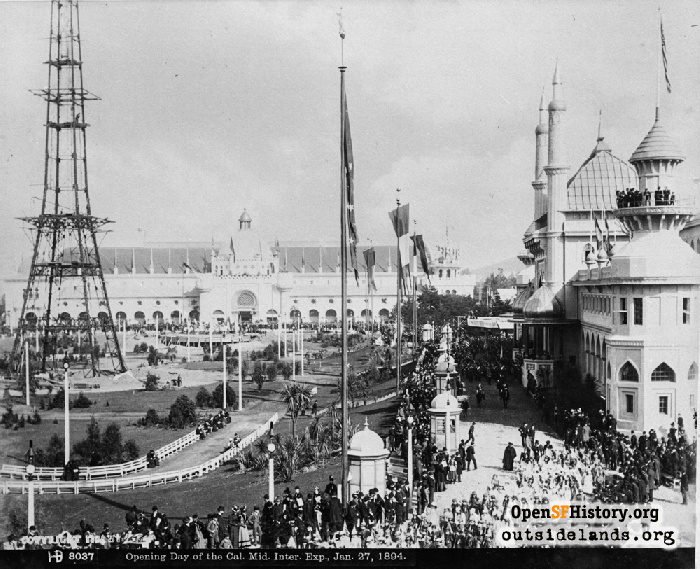 With the press of a button on January 27, 1894, the California Midwinter International Exposition officially opened. 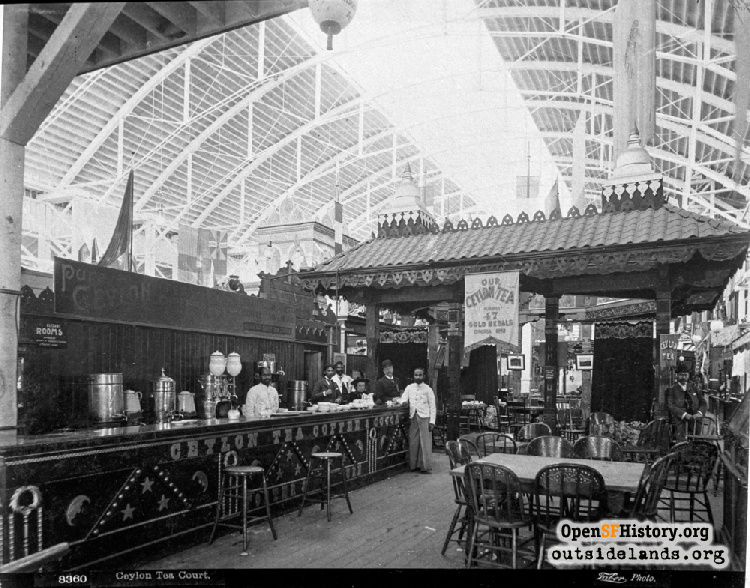 The official opening day of the California Midwinter International Exposition came after a rainy night. A heavy fog hung over the city at daybreak on January 27, 1894, but by 9:00 a.m. the clouds were clearing and a parade was forming at Van Ness and Golden Gate Avenues. When San Francisco Chronicle publisher Michael de Young began promoting the idea of recycling exhibits and attractions from Chicago’s 1893 World Columbian Exposition for a fair in San Francisco, his planned opening date was January 1, 1894. Despite a mere four months of time to pull it off after the August 24, 1893 groundbreaking, a January 1st dedication remained the plan. After all, a fair opening on New Year’s Day would offer the best proof to the world that California was the land of sunshine. But, ironically, weather delayed trains delivering many of the concessions exhibits and heavy rain in San Francisco slowed construction. The exposition did have a “soft opening” on January 1, 1894, and indeed, once the fences around the grounds had been erected in mid-December 1893, a twenty-five admission fee had been charged to the thousands of locals who paid to watch workmen hammering and early entertainers perform. 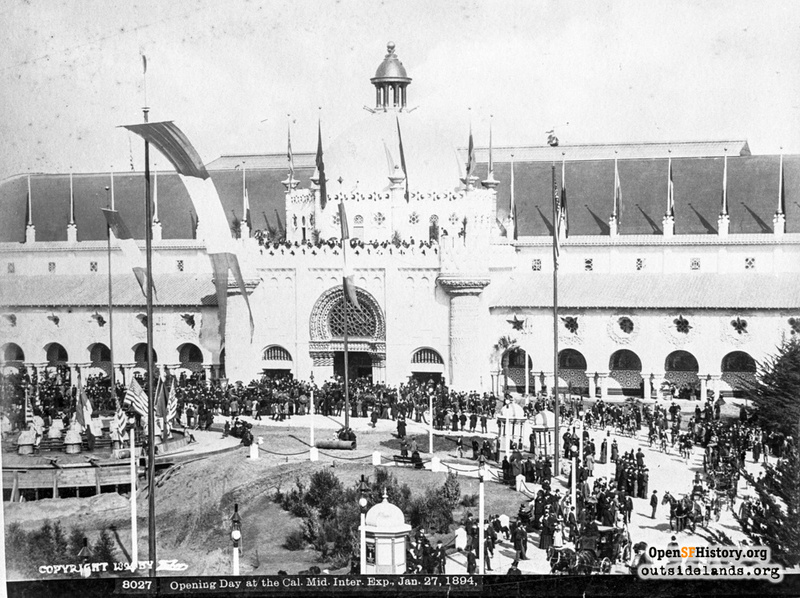 Now, on Sunday, January 27th, while still not complete, the California Midwinter International Exposition would open with a parade. Consisting mostly of military companies, bands, and dignitaries in carriages, the parade to the park began a little after ten o’clock. After the VIPs, bands, and military ranks came men dressed as prospecting 49ers on pack mules, habitués of the “Cairo Street” exhibit riding donkeys (their promised camels were a no-show), and 200 “wheelmen” on bicycles. Dahomey villagers from Africa who were such a hit at the Columbian Exposition were still en route to California, so an African-American vaudevillian stood in with his own version of Dahomey dress. 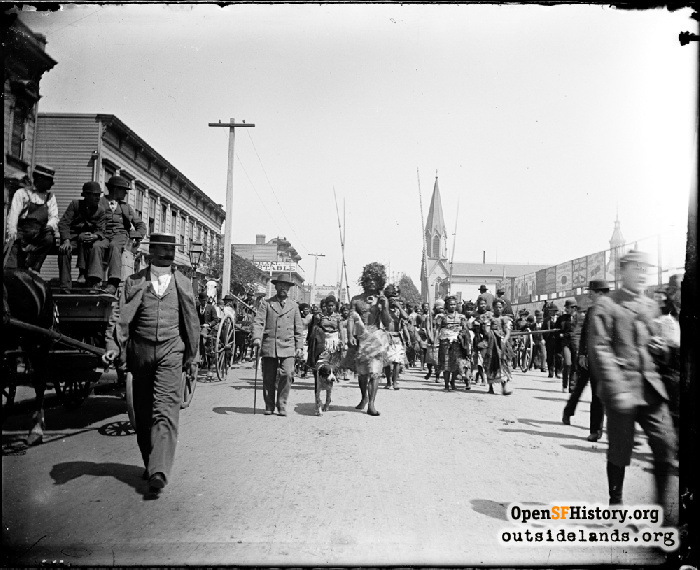 The parade headed west on Golden Gate to Divisadero Street, turned left to the park panhandle and continued through the main fair site now the park’s Music Concourse to the parade grounds in what is today the Big Rec baseball fields. More than 7,000 filled the grandstand and many thousands more spread out on the field before them for commencement ceremonies, which consisted of band music and lots of speeches. Finally, after hours of speeches, a key and electrical button on a plush cushion was produced and Mrs. de Young applied one of her gloved fingers to start the great dynamos inside the Mechanical Arts Building. Black smoke began emitting from the chimneys, electrical power flowed through the fair grounds, and the crowd cheered. Even rival newspapers had to admit it: opening day of the California Midwinter International Exposition was a success. 1. 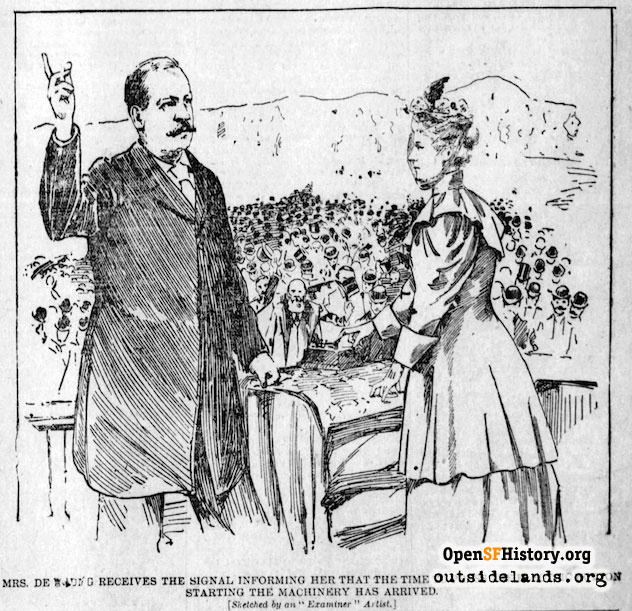 “The Fair Open,” San Francisco Examiner, January 28, 1894, pg. 1. 2. “The Opening of the Midwinter Fair,” San Francisco Chronicle, January 28, 1894, pg. 1. 3. “The Fair Dedicated,” San Francisco Chronicle, January 28, 1894, pg. 2. 7. “Glimpses of the Throng,” San Francisco Examiner, January 28, 1894, pg. 4. 8. “Glorious Fireworks,” San Francisco Chronicle, January 28, 1894, pg. 10. 9. “Within the Gates,” San Francisco Chronicle, January 28, 1894, pg. 10. Contribute your own stories about the Midwinter Fair!